Preheat oven to 350 F degrees. Line a 12 x 16 baking sheet with parchment paper and set aside. Add the brown sugar, butter and salt to the bowl of your mixer. Using the paddle attachment, beat on medium until well combined. Add the vanilla extract and eggs, one at a time and continue beating until light and creamy. Add the ginger, flour and baking powder to the bowl and continue beating until well incorporated. 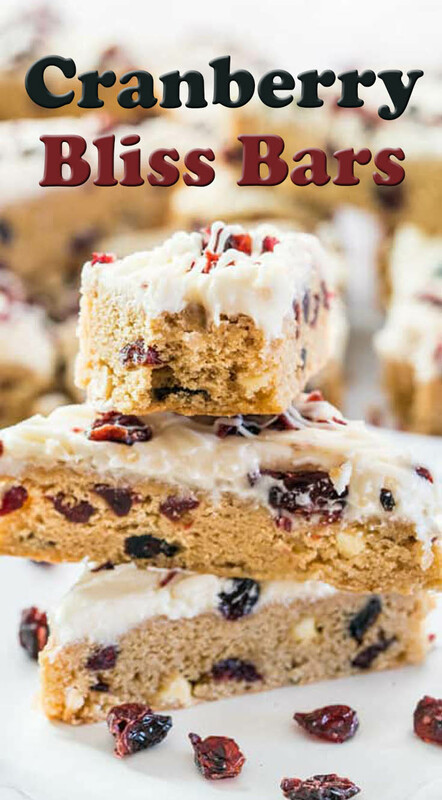 Fold in the dried cranberries and white chocolate chips using a spatula. Spread the batter evenly in the prepared baking pan. Bake for about 20 minutes until the middle is baked through. Do not over bake or the bars will be very dry. Allow to cool. Add the cream cheese, powdered sugar, vanilla extract and lemon juice to the bowl of your mixer and beat using the whisk attachment, until well incorporated, and the icing is smooth and creamy. Spread the frosting over the cooled down crust and sprinkle the chopped dried cranberries on top. Place the white chocolate in a cup and microwave, stirring with spoon in between as it starts to melt. Continue stirring until chocolate is melted then transfer it to a ziploc bag and twist the end around the chocolate. When ready to drizzle, snip the end with the scissors. Drizzle the melted white chocolate over the top and allow the bars to set until the frosting is not sticky to the touch. This will make it easier to cut the bars. Trim the ends of the bars for even edges then cut into squares, then cut the squares diagonally into triangles.